CLA Safflower Oil Leads to Weight Loss, Less Belly Fat-Unproven! - Truth or Fiction? Safflower Oil Supplement Leads to Weight Loss, Less Belly Fat-Unproven! Claims that safflower oil and/or conjugated linoleic acids (CLAs) supplements can help you lose weight, particularly in the belly area, have been circulating for years. There’s not enough scientific data to determine whether or not claims that CLA safflower oil promotes weight loss, and “busts belly fat” — but available research casts serious doubt on those claims. Most safflower oil weight loss claims are based on a single study from 2009. The study, which was published in the American Journal of Clinical Nutrition, compared how safflower oil and CLA helped 55 obese, post-menopausal women lose weight over a 36-week period. It’s important to note, however, that the study concluded that CLA safflower oil may help promote weight loss — not that it actually does. All the people involved were postmenopausal women with type II diabetes, begging the question of what the effects might be in men or younger women. Adverse effects occurred but were not specified. In addition, safflower oil was compared to CLA, an agent that has been reported to increase insulin resistance – the comparison may thus not be fair from the get-go. It seems that no consistent result was observed even in similar studies conducted at different laboratories, this may be due to variations in age, gender, racial and geographical disparities, coupled with type and dose of CLA supplemented. Thus, supposed promising results reported in mechanistic and pre-clinical studies cannot be extrapolated with humans, mainly due to the lack of inconsistency in analyses, prolonged intervention studies, follow-up studies and international co-ordination of concerted studies. Briefly, clinical evidences accumulated thus far show that CLA is not eliciting significantly promising and consistent health effects so as to uphold it as neither a functional nor a medical food. 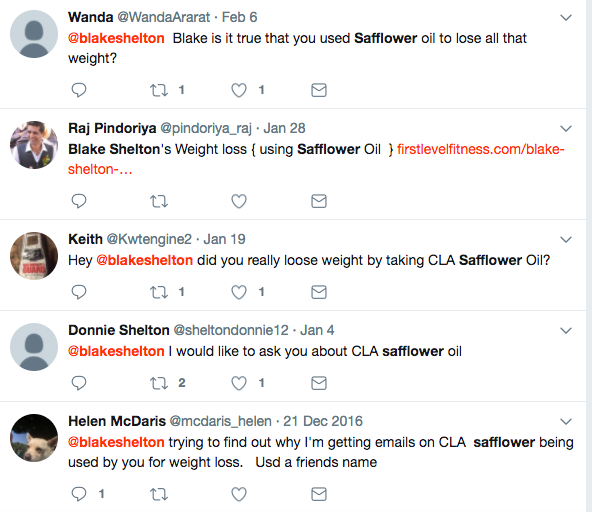 Unproven claims that Blake Shelton used safflower oil to lose weight continue to circulate on social media. So, CLA safflower oil weight loss claims have not been verified by the FDA, and available scientific research casts serious doubt on them. At this time, CLA safflower oil weight loss claims are unproven, and consumers should consult their physicians before taking any new dietary supplements. Yellowstone Lava Geyser Erupts for First Time in Human History-Fiction! Giant Florida Cane Spider Attacks House in Photo-Fiction!